Monitor It. Measure It. Improve It. Manufacturers are constantly challenged to increase productivity, improve quality and cut costs in order to successfully compete in today's market. Manufacturing technology, business intelligence and plant-wide visibility helps manufacturers overcome these pressures by ensuring critical information gets to the right people at the right time. With eFlex OEE, data is captured directly from machines/equipment and organized in a manner that drives peak performance. Visual content can be presented on any web-capable device such as large overhead displays, any PC connected to the network and mobile devices. eFlex OEE allows users to visualize and comprehend data from a number of Key Performance Indicators(KPIs) that represent different areas of the plant floor. 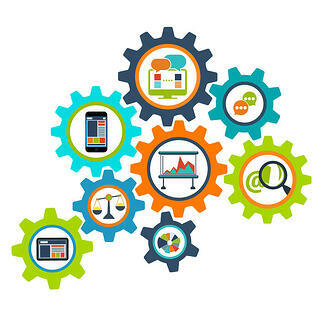 Reports and dashboards capture process and production trends using "smart widgets" from Analytics. Notification features pinpoint the most concerning problems allowing plant personnel to take action immediately. Streamline the collection of key performance indicators from shop floor equipment and operators. Interlock to machine controls to ensure events are properly classified. Gain visibility into production constraints, bottlenecks and quality concerns. Assign root causes to downtime events, classify idle time and enter scrap codes. Quickly notify key personnel via text and email when issues occur. Set production targets and benchmarks per asset and resource. 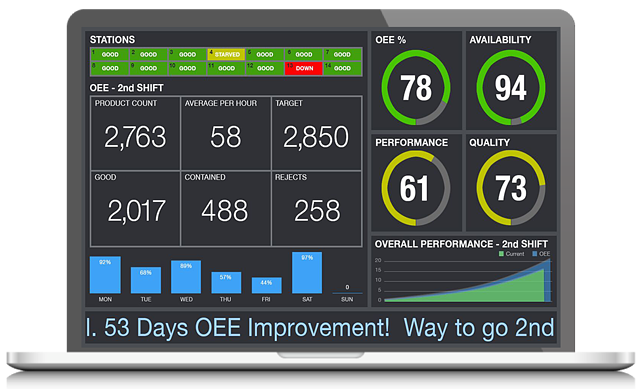 Configure dashboards to display current needs and historical trends to optimize improvement plans and processes. Obtain summary aggregation and drill-down visibility of assets, allowing you to boost productivity. Transparency of assets and resources allows for improved production, faster performance times with better quality. Data is provided in real-time. Personnel will have immediate access to critical data allowing them to make quick decisions and reduce downtime. Report manufacturing operation details such as machine status, shift peformance, downtime analysis, OEE, defects, operator productivity, etc. Provide tightly integrated security, activity logs and role-based access privileges. Contact eFlex Systems to learn more. Utilize OEE to maximize lean manufacturing efforts.